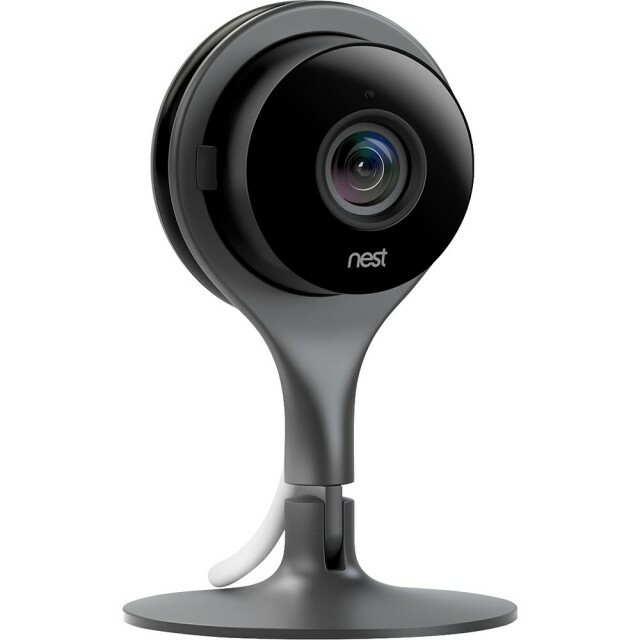 Last week we saw leaked images of a Nest camera. The device looks a lot like a Dropcam camera, which, of course, is now owned by Nest. Today the Nest Cam has shown up for pre-order on Best Buy’s website for $199.99. (Update: It’s also now on Google Play.) It appears that Best Buy accidentally tweeted about the device a little early, but the page is still live on their site. Receive motion and sound detection notifications for peace of mind while you’re away. Vivid 1080p resolution at 30 fps (frames per second) allows you to see small details on your screen. Keep an eye on things up to 20′ away when there’s little to no light. Communicate with people and talk to pets from anywhere with the built-in microphone and speaker. Choose which areas of your home you want to monitor more closely with Activity Zones. In addition to free live streaming, you can add cloud recording to save footage with a Nest Aware subscription (not included). The Nest Cam will automatically turn on when the Nest Protect (sold separately) senses smoke or carbon monoxide. By all accounts it looks like an excellent security camera. It has all the great features that Dropcam users have come to love, plus a few new goodies, and the integrations that has made Nest products so popular. We should be hearing an official announcement very soon. Are you going to buy a Nest Cam? Newer PostHow often are Hackers Caught?